I’ve always found risk-takers to be more interesting than path-of-least-resistance types. Even a simple wine grower in Southern Germany willing to roll the dice in the vineyard makes for an engrossing tale. There is a reason that Germany is more famous for its beer and bratwurst than its wine. Autumn arrives early and spring arrives late. In short, the growing season isn’t ideal for grapes. The ballsy German souls who choose to grow grapes rather than hops or barley have their work cut out for them. As vines bud and begin to produce grapes, a spring frost or hail storm can obliterate an entire vineyard. At the end of the season, growers run the repeated risk of frost and hail if slowly ripening grapes are not harvested quickly. For this reason, the bulk of German wine production has been supported by not-quite-ripe Riesling grapes combined with sugar at the time of fermentation to produce sweet and off-dry wines (think: the bottle of Blue Nun in your grandma’s liquor cabinet). It’s much safer to harvest earlier, add some sugar and live with mostly mediocre wine. Of course some wine makers are not satisfied with mediocrity. They strive to produce the sublime. Striving for the sublime requires a significant amount of risk. For the boldest of German growers the risk is losing most, if not all, grapes in a vineyard. The reward is offering ‘divine nectar’ for which, connoisseurs will pay a premium. In this corner of the world, the most significant factor is ripeness. In fact, the highest quality German wines are ranked by the ripeness level of grapes used to produce such wines. The entry level of ripeness for quality wines is called Kabinett. Kabinett wine is the Audi A4 of German luxury wine. No sugar is added to these wines and they are normally dry or slightly off-dry. Riper grapes qualify for the Spätlese (meaning ‘late harvest’) segment. These wines can also be either dry or off-dry. At this point, many risk-loving growers and wine makers figure they are pushing their luck to leave grapes on the vine so late into autumn. Thus, most of the high quality German wines you’ll find at the wine store are either labeled as Kabinett (from ripe grapes) or Spätlese (from quite ripe grapes). A nice example of the Kabinett wine style is Bassermann-Jordan Deidesheimer Paradiesgarten Kabinett, ‘02 (~$15). Of course, there are those who want to continue pushing their luck in the vineyard. For these grape gamblers, there are three more ripeness categories. Auslese is the first of these, and refers to the picking of select, very ripe grape bunches for wine. The resulting wine is either off-dry or sweet. Auslese wines generally have an intense aroma, complex taste and are quite unique in character. For the obsessive grower who wants to pick one grape at a time, there is the ‘über-ripe’ category, Beerenauslese, also referred to as ‘BA.’ These wines are made from individually selected grapes that are really, really ripe. The resulting wine is very sweet, very intense and very expensive. For the obsessive-compulsive grower who wants to pick individual overripe, rasinated grapes, there is the category Trockenbeerenauslese (also known as ‘TBA’). The resulting wine is extraordinarily intense, exotic and unique. A reasonably affordable example of these highly intense wines is Paulinshof Trocken Braunberger Riesling Auslese, ’99 ($40). At any point along this quest for ultra-ripe grapes and exotic wine, a severe frost could hit and ruin any chance of success. Yet some German wine makers actually welcome frost - if the timing is right. These folks are not only risk-takers, but also somewhat masochistic. You see, a grower might postpone harvest until grapes are exceptionally ripe or overripe and then pray for a frosty night. If conditions are right, the grapes will freeze on the vine. The grower will then pick these grape Popsicles, one-by-one, in the middle of the night and press them while still frozen to make something called, Eiswein (ice wine). Ice wines are not only exotic and intense, but they are also highly concentrated with both intense sweetness and intense acidity. Most ice wines are very expensive. However, the sensory overload is worth it. One to try is Hexamer Meddersheimer Rheingrafenberg Riesling Eiswein 2002 ($65). This wine will give you an introduction into the otherworldly flavors that comprise Eiswein. Yes, it is much easier and cheaper to buy a bottle of wine that is: A) labeled in English, B) around ten bucks, and C) tastes ‘alright.’ But the next time you go to the wine store, think of Horst, Ernst and Wolfgang – risk-taking German wine makers who left their grapes on the vine and scoffed at hail, frost and approaching winter. Look for the term Kabinett, Spatlese, Auslese, Beerenauslese, Trockenbeerenauslese or Eiswein on the label. Take a sip, sit back and appreciate the result of odds successfully defied. Cheers. You know, it was apparently a German who "discovered" Eiswein some 200 years ago. Surprised by an early frost, he decided to press the frozen grapes anyhow. He kept them separate from the rest of the vintage, to avoid spoiling the whole lot, but then discovered the juice was fine stuff indeed. This is all according to a book by John Schreiner on the subject. Speaking of Austrian Eiswein. Are there a few you would recommend to savvy Basic Juice readers? If you know about Austrian dessert wines, you probably know the name Kracher. Well, he does an Eiswein which is a cuvee, and it's good, but most folks agree that it isn't at the level of his other dessert wines (the "numbered" wines, which range from beerenauslese on up). If you can find it, Angerhof Tschida Eisweins are amazing. Also look for those from Helmut Lang, especially his 2003 Riesling Eiswein. My favorite Eiswein producer is Franz Heiss. This is a winemaker who has no heir to his winery, and so has spent his life concentrating on making great wines and pretty much ignoring marketing or exporting. He makes an Eiswein from the Traminer grape which is stunning- like a glass full of roses. I prefer the 2001 vintage to the 2002, but that's personal taste talking. He also makes an Eiswein from the very Austrian red grape varietal Blaufrankisch, which is a really neat rose color and has notes of violets with spice and exotic fruits. Heiss' Eisweins cost anywhere from $35 to $45 and upwards for a half-bottle. 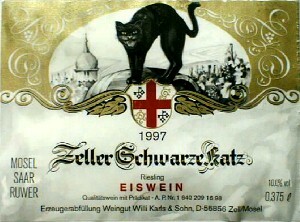 A great "bargain" Austrian Eiswein is from Weiss, whose Gruner Veltliner Eiswein is really tasty. Spicy, clean, and very good (if not excellent). At $18.99 for a half-bottle, it's a good deal. As a big fat disclaimer, I import Austrian wines and I sell the latter two that I have mentioned (the Heiss & Weiss) among others. But I got into importing because I love wine, and I wouldn't tell you about it if the stuff wasn't good. Thanks for the recommendations Emily. I also appreciate your 'big fat' disclaimer. However, I think it's almost unnecessary as your passion for wine is obvious in the descriptions you penned. I have no problem pointing Basic Juice visitors to Wine Monger - you offer a great selection of Austrian wein. I am a big fan of eiswein i jus tried it at chirstmas.